Gabriela is free without charges and not compelled to sign with the authorities. Welcome back to the streets! In the morning hours of November 19, the comrade Gabriela Curilem has reappeared on the street, ending his period of hiding for two years and three months. Recall that Gabriela is wanted following the “Bombs Case”, specifically from August 14, 2010- the day the arrests were made, the case was closed on 1 June this year, the day that 5 comrades were absolved. In this case, Gabriela was charged as the alleged financier of an illicit association that is supposed to have manufactured and installed bombs. That same August 14, Gabriela was not in the CSO Sacco and Vanzetti (self-organised centre which was raided by anti-terrorist units), where other co-accused lived. During the morning of Nov 19, Gabriela appeared before the Chilean justice system and was compelled to sign with the authorities (we do not know whether weekly or monthly) and is now back on the street. After a long process during which the $hilean state and the plaintiff institutions tried by all means to condemn the compas at any cost, they were absolved of all the charges, in the final hearing today June 1st, 2012. All the charges such as placement of explosive device and terrorist financing were dismissed; also they raised all the cautionary measures against the 5 compas. When the prison bars stop our hands from throwing the fire of anarchy into the world of power, our words become the sharp rasp of escape. Armed with thoughts, desires, secret plans, new conspiracies, we give a warmest embrace in our imaginary meeting with the comrades of action across the world. 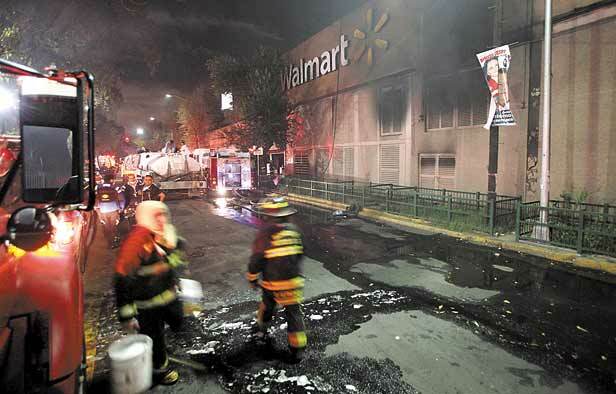 On October 4th, 2011, Judge Valderrama announced the latest discharges within the “bombs case”. The Prosecution solicited the discharges arguing there was a lack of evidentiary support to proceed to trial, in consideration of evidence that had been eliminated during the preliminary hearing. Finally 13 comrades – and the one miserable informant- were discharged from illicit terrorist association. 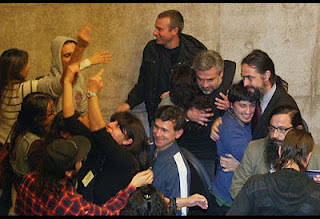 Pablo Morales, Rodolfo Retamales, Camilo Peres, Vinicio Aguilera, Diego Morales, Felipe Guerra, Carlos Rivero, Andrea Urzua, Monica Caballero, Francisco Solar, Candelaria Cortez-Monroy, Omar Hermosilla and the filthy collaborator. Candelaria was also absolved of placing an explosive artifact (at Automotora Atal, on March 27th, 2007). On his part, Cristian Cancino, is awaiting his own independent proceeding. Francisco Solar: Accused of three counts of placing an explosive artifact (ANI on January 18th, 2006, State Defense Council on December 21st 2006, and Chilectrica on October 16th, 2007) under law 18.314 (the Anti-terrorist Law). Mónica Caballero: Accused of placing an explosive artifact (Sacramentos Church on November 21st, 2009) under law 18.314 (the Anti-terrorist Law). Felipe Guerra: Accused of placing an explosive artifact (School of Gendarmerie on May 22nd, 2009) under law 18.314 (the Anti-terrorist Law). Omar Hermosilla: Accused of terrorist financing, under article 8 of law 18.314 (the Anti-terrorist Law). Carlos Rivero: Accused of terrorist financing, under article 8 of law 18.314 (the Anti-terrorist Law). Moreover, the miserable filthy informant, Gustavo Fuentes Aliaga, is also accused of two counts of placing an explosive artifact (ANI, State Defense Council) under the Anti-terrorist Law. 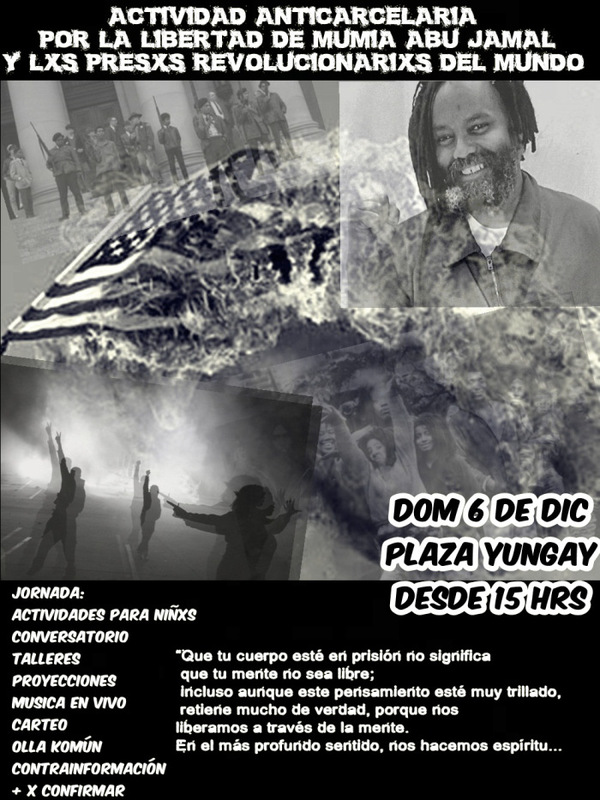 The trial against our comrades will take place on November 28th, 2011. CALLING OUT TO EXPRESS SOLIDARITY, & REMEMBER THAT THE TRIAL DOES NOT END WITH THE DISCHARGE OF SOME OF OUR COMRADES. Because the Bombs Case is not over: END THE ANTI-TERRORIST LAW! END THE POLITICAL TRIALS!! DROP THE CHARGES OF THE FINAL 5 ACCUSED!